What is a good 3dmark06 score these days?? Page 7 - Seeking answers? Join the Tom's Hardware community: where nearly two million members share solutions and discuss the latest tech. My Tri-SLI setup scores 21,082 & my other rig also has an eVGA 780i,and QX9650 plus two 512 8800 GTS's scored 17,322 which is a good score for the 512 version. Not really, SLI gt depends on your processor. Same processer @ the same speed as the author of the post I was commenting on. Don't get me wrong, you score is nice. I'd love to see what it would be like with 2. I'm seconds away from buying 2 and finding out. The MSI was faster at 3.2GHZ with a Q6600. Same 2 1GB sticks of RAM and the same 2 8800GT Stock clocked video cards. 13996 which i plan on getting to 14000. Score was achieved with the specs in my sig. RAM is running at 766mhz so once i oc the ram to about 850 i'm hoping it'll get me those 4 points. lol. EDIT: Woot just got this. It was a quick bench before i OC the ram...turn out unsyncing my ram to up it to 850 yielded a performance loss. Well My Phenom 9600 BE @ 2.475, 4 GB @ 860MHz, and 8800GT SC @ SSC speeds gets about 11700 in XP. So, based on the fact that it plays Crysis in DX9 on all high/some max w/4X AA no stutters I'd say this is a good score. My Friend's 5600+ @3.2 and hevily OCed 8600GT score nearly 7k (with 6 gigs of ram) and he runs crysis fine on med/high @1440X900 with no stutters. So based on that I would say 7000+ is a good 3DMark06 score. I get 16,308 with my new build. Intel X3360, EVGA 790i Ultra MB, 4 gig Corsair DDR3-1333, WD Raptor 150 gig hard drive, dual 8800GTX OC's in SLI. Everythings set at stock speed. No overclocking, (yet). Will try to push it closer to 13000 with some more overclocking trickery. How is a score of 114001 using an 8800gtx with a amd 6000 @3300 ghz? Is that a decent score let me know? CPU Cooler is an Iceberg 7 ??? to run with it but it crashes ALL the time, even with SP1. Any ideas on why? Second, what exactly is the error when it crashes in Vista? If it bluescreens, what is the stop code? runnin on xp 64 is this an ok score this is my first build cheers neiloggy. does ne 1 else agree that this is value for cash lol neiloggy. 3d mark06 score is 16275 all for 395 cash all new parts?????? Anyway I can get 21K with a PhenomII@3.7Ghz. yes but thats a quad core cpu and a twin core gpu how much them monsters cost ya eh??????? 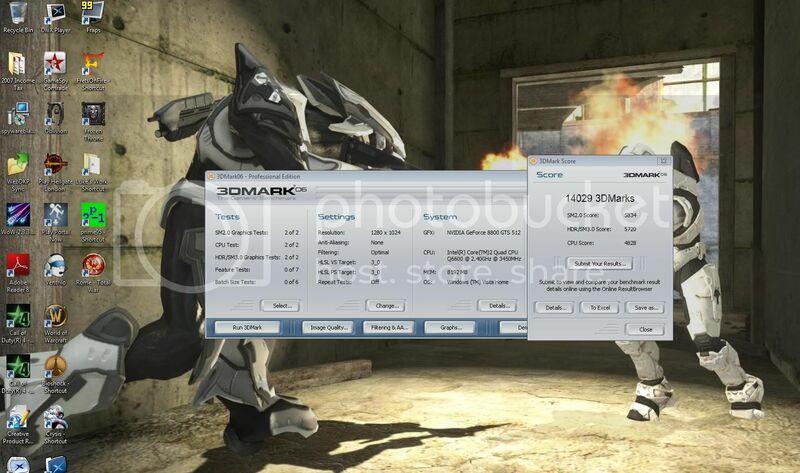 i just got a 37563 3dmarks, with the free download version of 3dmark06..
Is my 3DMark score good?